After only three years in business, RMD Law has established itself as a ground-breaking leader in personal injury cases in Orange Country. The firm’s energetic approach combines hard work, the application of high-tech equipment, tenacity and drive, and a joy at doing their work that is obvious even to the casual observer. Partners John Rajaee, Aria Miran and Nicole Dolle provide each client with “three attorneys for the price of one” in a process they call “Personal Injury 2.0.” Practice areas range broadly, from simple dog bites to spinal and brain injuries to such leading edge arenas as self-driving car accidents. RMD Law differs from many PI firms in that they have the talent to litigate cases in-house and do not have to refer complex matters to outside attorneys. Years before forming RMD Law, Miran and Dolle worked together at another PI firm. They became instant friends who shared a dedication to the work combined with a playful spirit. Becoming partners at some time was a natural evolution. Rajaee is Miran’s brother-in-law and that relationship easily led to a desire to work with each other. In a very real sense RMD Law is a family firm. That new path wasn’t without challenges. During their first eight months, business was conducted at Miran’s Irvine kitchen table with client meetings conducted at a Servcorp executive suite. They kept overhead low so they could focus on satisfying clients instead of buying “bells and whistles.” Today, the firm has eight employees: the three partners, a post-bar law clerk, one paralegal, and three case managers. “We opened a firm together because we have deep respect for one another and we wanted to strike our own path. That gives us the freedom to choose how we wanted to serve our clients. This was something that cannot come from working for someone else. You have to take a risk and hang out your shingle,” Dolle says. Their 2.0 approach has proven to be an effective one. For example, the firm received a call late in the evening from a mother whose son lost his little finger after riding down a public slide in a city park. Miran and Rajaee rushed over to the parents’ house and sat with the family. Later they walked over to the park in the pitch black darkness to investigate the situation. All three partners worked with the family to make sure the child received the best medical treatment possible, that they properly filed with the city, and that they were able to make it to mediation. The mediator was convinced that they would not get their top asking value, and believed that even a great settlement would be no more than $400,000. Ignoring the mediator, they pushed forward. At the end of the day the city settled for $600,000, ensuring that the child had more than adequate compensation for his loss. The city was held accountable for its negligence. The term “Personal Injury 2.0” isn’t a clever marketing slogan. It’s a very real, time-tested process created to provide exceptional service. Through that process Rajaee, Miran and Dolle provide a number of advantages. For one, as a young firm, they are filled with energy and drive. They are motivated not only by the obvious need to succeed as a business, but also to achieve results as representatives for their clients. RMD Law takes pride in its ability to respond instantly. Whether the case is a complex auto accident, a dog bite, or a simple slip and fall, all three partners can be instantly contacted by e-mail. Potential clients can expect an immediate reply. This approach applies to attorney referrals, too. “Even if we have to investigate further, 100 percent of the time we will reach out to the client. No more referrals that go into a ‘black hole,’” Miran says. The firm’s main referral partners are getting six figures in referral fees annually. They have paid out more than $200,000 in referral fees. They sign 2-200 letters at the onset of the case, so the other attorney is involved from the get go. And they make sure all payments are on time. The partners believe in intense preparation for each case. Even seemingly impossible results can be obtained if the attorney is thoroughly prepared for the negotiation or the trial. Achieving and maintaining the Personal Injury 2.0 concept required significant investment and the partners believe in investing in the best of everything from Class-A furniture to top-of-the-line computer technology. The firm is totally paperless and highly digital. There is no cumbersome filing system. Customized software does the busy work so the attorneys and staff can focus on doing what they do best—helping injured people get the care and compensation they deserve. Personalized care starts from the initial client contact, which is always with one of the partners. The firm does not employ investigators. Clients receive individual text numbers, so that they can send us pictures, videos, or messages 24 hours a day. An example of how the firm provides that personalized service was in response to a call from a woman who was distraught and pregnant with her first child. She related the story of her husband who was killed on the side of the road after getting out to check his tires one evening. No other firm she had contacted was willing to take her case, assuming the husband to be at fault. The partners were eager to take on this difficult case. Rajaee personally drove more than 100 miles to meet the client and her grieving family in person and after sitting with them for more than three hours, decided to take on the case. After intense investigation they were able to find fault with the driver of the vehicle, enabling RMD Law to recover the full policy limits and obtain $100,000 for the family. The proof of their approach is found in the results obtained for their clients. RMD Law has settled millions of dollars in claims. Miran is a Multi-Million Dollar Advocate, and all three partners are Super-Lawyers rated. 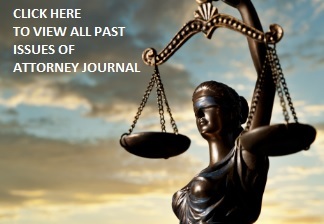 Each has been named Rising Star Super Lawyers, and have won countless attorney awards such as The National Trial Lawyers Top 40 under 40, the Avvo Client Choice Award, the Multi-Million Dollar Advocates Award, the 10 Best Attorney Award by American Institute of Personal Injury Attorneys, and the 2018 Excellence Award by Lead Counsel. The firm recently was awarded a $2 Million settlement for a wrongful death claim and a $375,000 victory for a minor child who was hit by a vehicle. “Nobody can touch RMD in the PI game, and in general hustle. When you’re really prepared and enthusiastic about your case, the process actually feels easy because you’ve done your homework and you are doing it right. Basically, we are high energy, and we truly get after our cases,” Rajaee says. The typical RMD Law client is someone who has suffered some type of terrible accident and is in over their head—hit by a careless driver, bitten by a dog, or something striking from left field while they were just minding their own business. Suddenly, enormous medical bills pour in and the client experiences anxiety over how to cover the mounting expenses. Rajaee is generally the initial contact who shows the client a path to recovery. He assures them that proper medical treatment is available, that the lawyers truly care, and that they will be professionally represented in the face-off with the insurance companies. The typical client is someone without resources who desperately needs someone to go to bat—real people in need of someone to help out on a contingency fee basis. An example of a successful outcome involved a woman who had been told by other firms that her case wasn’t worth pursuing.